This is something that is quite difficult to do for anyone. Blessing those who are cursing you is not a natural thing for us. The fact that God has pointed this out to us as something we should do shows that there are some blessings that are locked up in this action. Love is an action word. Therefore, in order for us to love our enemies we have to back it up with action. It is not enough to say “Yes, I love so and so” we have to back up our action by being kind, patient, gentle and blessing our enemies with our words. 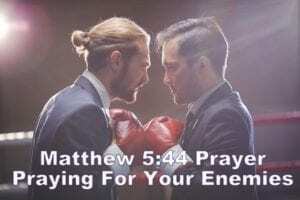 What are the benefits of praying for your enemies? Further in Matthew 5:46 it says “If you love those who love you, what reward will you get? Are not even the tax collectors doing that?” So we see that there is a reward for loving our enemies. So your blessings may be held back because you are not following this commandment. Father God, Your word says bless those who persecute you; bless and do not curse. Lord because you have commanded me to act in this manner when I am being persecuted, I offer to you (name of person) to be blessed in Your name Lord. I pray that you will bless this person with (specifically name everything that you know is a godly desire of this person) bless them when they are coming out or going in, when they are laying down and when they are getting up. Bless their entire family, their husband/wife, their children that their entire family will be saved. I pray that they along with their entire family would fulfill the purpose you created them for on this earth. That they would not be lacking in any good thing. That their barn would be overflowing with Your riches from heaven. That you would bless their ministry and their family causing them to prosper above all they could ask think of imagine. 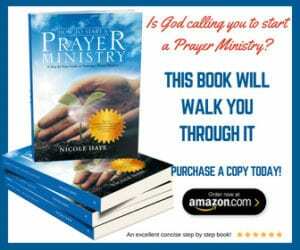 I pray hat you would bless and establish to work of their hands for your glory and honor. I pray that you would keep them in good health to do your work and to be used according to your purpose. I choose this day not to repay anyone evil for evil and as far as it depends on me to live at peace with everyone. I will not take revenge but I will leave room for you Almighty God for it is Yours to avenge; Instead if (name of person) is hungry, I will feed him/her; if he/she is thirsty, I will give him/her something to drink. Whatever is in my power or control to give or do I will do it Lord. I will not stand in the way of their success even more so if it is related to building your Kingdom. I will not be overcome by evil, but I will overcome evil with good. Lord I pray for your special grace that when I am cursed, I will bless; when I am persecuted, I will endure it; when I am slandered, I will answer kindly. Lord Jesus, I do not think of myself more highly than I ought, but rather think of myself with sober judgment. For the same persecution I face this day is the same persecution you faced. Even today there are times when I still persecute You and make you out to be a liar when I know what your word says and still disobey. I ask that you forgive me Lord and make intercession for me as I am reminded daily of your mercy & grace. I pray that as merciful & gracious as you have been to me so I will offer the same to (name of person) and I forgive them this day. Therefore, in view of Your mercy, transform me by renewing my mind with Your word. Cause me to see __________ as you see them, to have a heart of love for them as you love them to understand them through Your eyes and to have speech seasoned with wisdom when I speak to them. In blessing (name of person) I acknowledge that I am indeed your daughter/son and I know that my reward is with you for honoring you by obeying your word. In return I ask for nothing more than a release from any evil thoughts, intentions or feelings and a renewed joy and freedom to serve You. In Jesus Name. Amen.